The annual veterans parade at the Iowa State Fair turned controversial Monday when a Democratic veterans group was barred from the event. 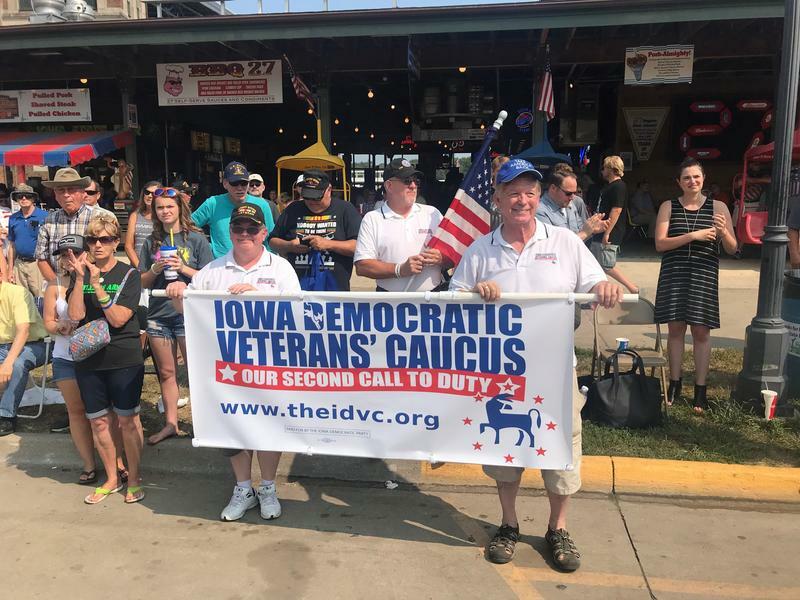 The Iowa Democratic Veterans’ Caucus was initially issued credentials from the Iowa Department of Veterans Affairs through what organizers call a clerical process. But when the organizers reviewed the applications late last week, they recinded the credentials for the IDVC. Daniel Gannon is part of the informal group of organizers he calls the Iowa State Fair Veterans Committee. He says they’ve always banned political groups. “The parade can’t be about politics,” Gannon said. “I don’t agree with that,” countered IDVC chairman Ron Healey. Healey says the IDVC marched in past parades in 2008 and 2015. Gannon says they have records showing who participated only from 2011 to 2018. He says the group “slipped through” in 2015, and they formalized the rule against political participants in 2016. Healey says the organizers don't have that in writing. “They don’t have a rule to defend,” Healey said. According to one member, the informal group is made up of representatives of the Iowa Department of Veterans Affairs, the Iowa Commission of Veterans Affairs, and the Iowa National Guard. It is not affiliated with the Fair Board. Gannon also chairs the Iowa Commission of Veterans Affairs. “By disinviting our veterans from a parade they have marched in for years, the Reynolds Administration is telling Democratic veterans that their service is worth less than others’ for purely partisan reasons,” Healey wrote in a statement. Healy said other political participants were allowed to march in Monday's parade, including Republican Secretary of State Paul Pate who is running for re-election. Veterans for Peace also marched in the parade. Healy called it a political group. Gov. Reynolds' Chief of Staff Ryan Koopmans said the governor was not involved in the decision to exclude the Iowa Democratic Veterans Caucus. “We’re trying to track that down,” Koopmans said Monday morning after news of the controversy spread on social media. This story was updated at 8:10 p.m. Tuesday to reflect that the IDVC's credentials initially came from the state Dept. of Veterans Affairs, and that those credentials were rescinded after intially being approved. The update also clarifies the organizations that make up the Iowa State Fair Veterans Committee.